Collaboration software lets a business share ideas and information among people and across an organization. In an age when contractors and teleworkers are the norm for small businesses, it's easy to see why collaboration software can help connect people and information when it's needed most. Collaboration software enables communication, but there are many other benefits to consider: Improved project management, better workflow, better management of invoicing and knowing that employees and partners have immediate access to critical business information and documents when they need it. Many collaboration systems are designed to meet the needs of most small businesses. Many are affordable, too, available as cloud-hosted applications that charge companies based on the number of employees using the software. Here are six full-featured options for anyone looking to invest in small business collaboration software. Most integrate with your existing office productivity and communication tools; if not, you can migrate existing data from a number of sources and programs. AffinityLive is a customizable business system designed to help businesses manage clients and projects. It offers tools to organize business contacts, email and calendars, as well as share information and documents with your colleagues. Key features include task tracking, project management, scheduling, accounting integrating and email, notes and collaboration. Users can create a central index of all client email interactions, stored against the sale, project, issue or client they relate to. AffinityLive integrates with online business tools such as Google Apps, Exchange Server, Yammer, Intuit, Twitter and MailChimp. AffinityLive can help small businesses to organize business contacts and share information from a central index. Price: AffinityLive offers plans starting at $29 per user per month, with its premier cloud platform starting at $59 per user per month. The Box service offers online sharing and collaboration for any business, from the small home offices to schools to enterprise IT shops. Using Box you can securely store content online to access, manage and share it from anywhere. The Project Collaboration feature is designed to centralize files in a single online workspace so co-workers, contractors or anyone else to whom you grant access can view, edit or upload files and collaborate on specific projects or tasks. Box Business and Box Enterprise accounts, meanwhile, provide a central place for sales and prospects to share critical information. Box integrates with Salesforce.com, Google Apps and other business services. Price: Business plans offering content collaboration and user management start at $15 per user per month. A $5 per user per month Box Starter Plan is also available. 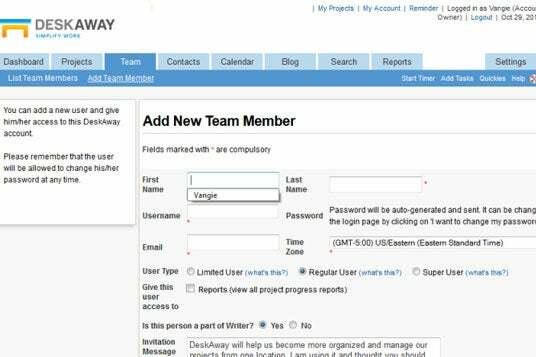 DeskAway Web-based project collaboration software helps sync the different teams in your business by providing a central location to organize, manage and track work. The app provides secure online backup and is permission-based to give users control what information stays private, is public or gets shared. With DeskAway, you can manage group activity as a project and track it online, view project history and milestones, set recurring tasks, track employee timesheets, share documents and files and also add comments and assign tasks within DeskAway or from email. The software automatically produces analytics and reports and integrates with a number of tools, including Google Apps, Freshbooks, Twitter and Facebook. DeskAway Team lets small businesses quickly add users and grant access to projects the individual is involved with. Price: Professional accounts for 20 users starts at $25 per month and go up to $179 per month for unlimited users and projects. The Google Apps cloud-based productivity suite helps teams connect and get work done from anywhere on any device. The suite includes Gmail, Calendar, Docs, Spreadsheets, Slides and Google Drive to store and share documents in the cloud. With Google Apps, you can share files and document folders with individuals, customers or your entire team. Multiple people can work on the same document at the same time and others see changes live. Other Google Apps for Business features includes Google Hangouts (for group chats and video conferences) and Google Vault (an optional archiving and e-discovery tool). Price: Google Apps for Business starts at $5 per user per month. Google Apps for Business with Vault starts at $10 per user per month. Huddle cloud-based collaboration software lets you share files with colleagues, collaborate on content and connect the people who contribute to a project. Features include a collaboration dashboard to give users immediate access to important information, secure file exchange and storage, an activity trail that automatically records a history of user activity, and document versioning. Huddle also uses intelligent recommendation technology to deliver up-to-date content to mobile devices. The software can be used to share and mange files, manage tasks and people and share and track Web-based presentations. The Huddle task management screen lets you easily create, assign and edit team or individual tasks. Price: The basic Workgroup plan, offering team content collaboration, starts at $20 per user per month. Enterprise and unlimited usage plans are also available. If your employees are familiar with the Microsoft Office productivity suite, then Office 365 is worth considering. This Web-based version of Microsoft Office runs in the cloud in mobile and browser-only versions, giving businesses a team site to manager and share business email and documents. The latest versions of documents are always available online, and there are plenty of options for tracking changes and sharing. Analysis: Is Microsoft's Office 365 Bet Starting to Pay Off in Enterprise Adoption? Office 365 also offers management for team projects, online video conferencing, screen sharing and instant messaging using the Lync Web App. Hosted email and online storage are available as well. Upgraded versions of Office 365 also provide desktop versions of Word, PowerPoint, Excel, Outlook, OneNote, Lync, Access Publisher and Lync. Price: Office 365 for Small Business starts at $5.10 per user per month. It offers Web-based versions of Office applications. Upgrade plans include desktop versions of Office applications.